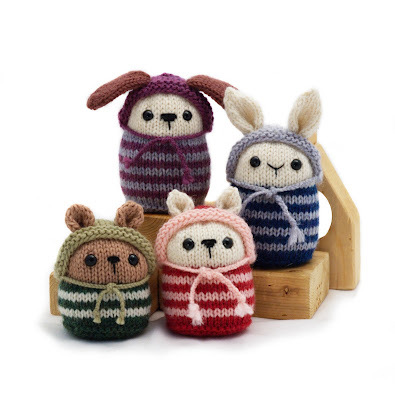 Can you knit just one of these cute critters? Here are the main details. Pookies are bean-bag animal toys in 3 sizes (3", 3 1/2", 4"). To make a set of 3 toys (one of each size), you need 50 g each of 3 colours of worsted weight yarn. However, this is a great project for using left-over yarn. The toys are completely knit in the round, on 4 mm DPNs or circular needle (your choice). The ears and hood are knit separately, then attached to the toy. The pattern gives instructions for 5 ear styles: mouse/hamster, bunny, puppy, kitty, and bear. Other materials required are polyester stuffing, ¼ cup dried beans or plastic beads per toy, 3 pairs of 9 mm safety eyes, black yarn to embroider the face, tapestry needle, 2 stitch markers. If you're a member of my Ravelry group, I would love some photos and feedback on the pattern, since these toys are very different from my other designs. Happy knitting everyone, and I hope you all have a great day! *I won't be listing the pattern on Lulu, because their fees are too high, and we're going to move away from selling anything but the books there. Posted by Barbara Prime at 8:11 a.m.
Awwwww, these are so cute Barbara that I had to buy the pattern and I'm going to try them out with handdyed yarns. February 8, 2011 at 9:28 a.m.
February 8, 2011 at 1:58 p.m.
Yipee! Bought it. Joined the group. YAY!! February 8, 2011 at 10:01 p.m.
Their name is just too perfect! February 9, 2011 at 12:56 a.m. These are adorable! They will be the next pattern I get! February 9, 2011 at 7:42 a.m. I've never knit in the round before...do you think this pattern would be ok to start with? February 18, 2011 at 10:11 a.m. While the over-all pattern is quite simple, these could be a little tricky for your first knit-in-the-round project. The base starts with a small number of stitches, with several rows of increases, which can be a pain if you're not comfortable with dpns. February 18, 2011 at 11:18 a.m.
How cute, cute, cute! I just downloaded the Well-Dressed Bunny pattern, but this one will definitely have to be next on my list! February 22, 2011 at 8:58 a.m.